Complete your Halloween party with spooky non-woven cloth table, door, wall covering. Drape or swag from railings, bannisters, across windows and more! 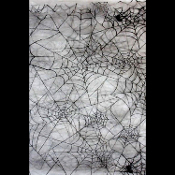 Spooky spiderweb printed non-woven cloth for haunted house, yard, dungeon, torture chamber, graveyard cemetery scene, pirate, mad doctor, scientist, laboratory backdrop scenery or party decor. Halloween black on white allover-print witch haunted house dracula castle theme print.